In his most extraordinary book, "one of the great clinical writers of the twentieth century" (The New York Times) recounts the case histories of patients lost in the bizarre, apparently inescapable world of neurological disorders. 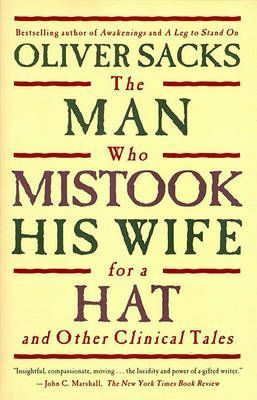 Oliver Sacks's The Man Who Mistook His Wife for a Hat tells the stories of individuals afflicted with fantastic perceptual and intellectual aberrations: patients who have lost their memories and with them the greater part of their pasts; who are no longer able to recognize people and common objects; who are stricken with violent tics and grimaces or who shout involuntary obscenities; whose limbs have become alien; who have been dismissed as retarded yet are gifted with uncanny artistic or mathematical talents. If inconceivably strange, these brilliant tales remain, in Dr. Sacks's splendid and sympathetic telling, deeply human. They are studies of life struggling against incredible adversity, and they enable us to enter the world of the neurologically impaired, to imagine with our hearts what it must be to live and feel as they do. A great healer, Sacks never loses sight of medicine's ultimate responsibility: "the suffering, afflicted, fighting human subject."